What is ChmHelp Authoring Suite? Macrobject ChmHelp Authoring Suite is a sub set of Macrobject Help Authoring Suite. You could use it to generate Microsoft HTML Help (CHM Classic) and CHM Unicode Help (CHM Modern). 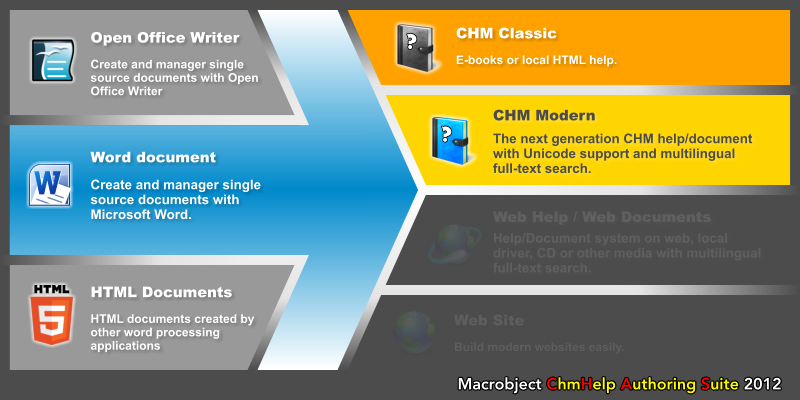 With Macrobject ChmHelp Authoring Suite, you don’t need any HTML/CHM skills, you will get professional CHM from Microsoft Word document. The generated CHM will be so professional as professionals write manually. The more important is, ChmHelp Authoring Suite will create Unicode version of CHM which supports multilingual in one CHM. We call the new Unicode CHM is CHM Modern.